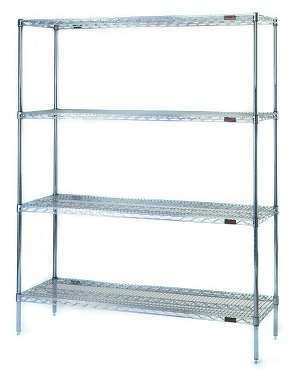 higher capacities, durable wire shelf construction, and longer lasting exterior finishes with Eagle Wire Shelving. Unique design offers high volume, easy access storage in a variety of finishes to suit your needs. Open wire truss reinforced shelves feature front to back welded surface ribs for added strength. Increases light penetration, free air circulation and merchandise visibility. Minimizes moisture and dust accumulation. Easily adjustable and expandable to change with your needs. Shelves adjust on 1" increments. The Material Handling Division was created to meet the needs of a multitude of manufacturing operations. The multifaceted product line can be put to use in all types of warehouse and storage/retrieval operations. Electronic based manufacturing is suited for Eagle Group Wire Shelving. The Eagle clean room/lab offering is designed to provide options to meet the myriad of storage and processing needs in critical environments.